Once something is invented, it is inevitably adopted/captured/absorbed by other cultures. In the case of the Egyptians, the first (Historically provable) adoptee of their locking mechanism were the Greeks. Now, I’m gonna put this here for all those smartasses. Yes. Rocks and caves came before keys and locks. You win. Congratulations. This is the Greek “improvement” over the Egyptian style lock. It was operated with a sickle style key, that had no teeth. The bar on the lock, as you can see, is where the teeth that we now find on the key were located. These locks are more comparable to today’s night latchs, or dead locks, than to deadbolts. It was a much simpler construction than it’s Mesopotamian inspiration. 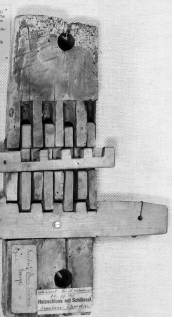 This is the later Egyptian style lock. Just sayin. Mind you, Greeks did use padlock and chain on top of the door mounted locks pictured above. Certainly more secure, but they would have also been a great deal more expensive for locksmiths and blacksmiths to reproduce. Padlocks, at this time, would have been luxury item used on temples, gated homes and public service buildings. Substantial history on Greek security is difficult to nail down (haha). I get the distinct impression that no one really knows for sure what was actually theirs and what was shared technology from elsewhere. What we do know is that the Greeks did have an impact on lock improvements, at least in making them available to the general public. And they really appear to be the first peoples to attempt to put locks on every door, rich or not so much. I think we’re gonna touch on the next civilization credited with improvements to locks next; the Romans. 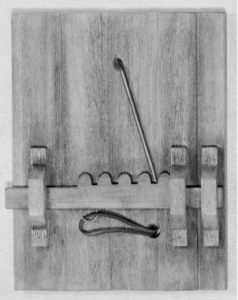 The first provable locks designed to be mounted inside doors appear to have come from them, as well as a return to the pin-style system found in the older locks. 73roN1 ItaаАабТТаЂааАабТТаБТs actually a nice and useful piece of info. I am glad that you shared this useful information with us. Please keep us informed like this. Thanks for sharing. b8zIuC Wow! Thank you! I continually wanted to write on my blog something like that. Can I take a portion of your post to my website?